Dignity in dying. A guest post from Tasha. Tasha is my best friend. Her nan recently passed away and the following day I received this email from Tasha. It was so powerful and so heartfelt that I immediately asked if I could share it. I found an injured bird on the floor a few weeks back. My dog had picked it up in his mouth (probably to confirm his suspicions that it was a tasty snack before gorging down on it). I thought he had a mouthful of dog excrement so, like any mental dog owner, I went about extracting it from the grips of his jaw. He was strangely gentle with it which is when I realised it was warm and soft. The bird had a severely twisted leg and its breathing was very laboured. My brain immediately leapt to different scenarios, should I put it out of its misery? Should I perform a minor surgery following an online forum? Or should I just take it to the vets and let the experts decide the bird’s fate? I chose the latter, not wanting to play God and all. After a quick call to the emergency vets I was on my way to the other side of town with the little bird, still fighting for his life, in an old kettle box. This bird was resilient to the end. I had witnessed him being picked up in a dog’s mouth, grabbed out of that same mouth, walked home in the hand of a human to a house with bright lights to finally being placed in a towel in a box. I’m sure the stress alone should have seen him off but, some things are made of tougher stuff than we think! This is why, after a 20minute car journey to add to that list of dramas, I was now standing in front of the vet being told ‘we’re sending the bird off to heaven’ feeling very cheated. The little bird had already been through so much trauma, and so much pain, it seemed cruel and barbaric to put it through anything else. Even if they operated it would only be a 50/50 chance the bird would make it through the surgery, and following surgery he may not ever regain full quality of life. It was true. I couldn’t argue with that logic, and I knew in my heart I only wanted to prolong the life of this little bird because I had seen his struggle and had been there until the end; but to even attempt to save his life would have been a cruel form of torture for him and I had to agree that even if I have an issue with anything dying, it shouldn’t be at the expense of someone/something suffering to save me that pain. I had another encounter with death only this week. My wonderful Nan passed away on Monday 20th July, mere weeks before her 93rd birthday. Those that know my Nan will know just how resilient she is. This remarkable woman has survived cancer, hernias, diabetes and a run in with a triple heart bypass to name but a few. She didn’t even tell us when she was going through her breast cancer! She had her cataracts done which made her visually impaired for the last decade of her life and eventually ended up with a stoma too. She had a false hip and a false shoulder due to a few falls, but not once did I hear her complain. That’s a lie, if you knew her like her family did you’d know she complained all the time that she couldn’t see anything properly. So much so had her site gone that whenever my mum came to visit, my nan would point out all the cobwebs the cleaner had missed. Her hearing wasn’t much cop either but god forbid you should swear within a mile radius of her; she’d read you the riot act for that! Despite all of the above, my Nan went about her life as if she had never experienced pain. So wonderful is our NHS and our modern day medicine that we had the very good fortune of the company of my nan for well over 20 years more than we probably should have. In the last 3 years of her life, we have to thank the wonderful kindness of the carers who cared for her in her final home, Hill House in Lexden. We must never ever take away from any experience the wonderful work of people. But this is where we have to progress. The second part of this incredible woman’s life is something I would wish on no one whether you are a witness or the victim. My Nan eventually fell victim to old age and all the trials and tribulations that come with a tired body. Having been in and out of Hospital for a few weeks on the trot it became apparent there was an underlying issue. Nan had a double hernia which was preventing any food or water passing from her stomach into her intestines effectively closing down her body. We were left with two options. To rectify the situation the wonders of modern day medicine and the power of people could perform surgery to rectify the illness. The issue with this is that at the ripe old age of 92 and with a body that was tired and weak, Nan would probably not make it through the surgery. The second option was to send her home to be comfortable. That’s right, comfortable. I ask you, just how comfortable do you think a tired poorly 92 year old lady can actually be when her muscles are poking through the walls of her intestines making her throw up whenever she attempted to nourish herself. For 8 days we watched my Nan go from a slightly senile elderly lady who always had a smile for you, to a small shell of a lady, gasping for breath and unable to do anything but sleep. I wished for my nan to pass away quickly so many times that week. At one point I even tried praying. I witnessed the most barbaric, cruel and twisted act of love in the world. The act of making a loved one comfortable when you know the inevitable is going to happen. This has to stop. For so many reasons this has to stop. We have come so far in medicine that we can prolong a life by 20 years, but we can’t seem to get over ourselves when it comes to allowing a very poorly person to die in dignity. Had my nan known that she had her family around her (she hated to be on her own) it would have given her immense comfort. What she would have loved more is for her family to have remembered her for how she was. Not the frail, weak, skeletal lady she became at the end. The lady who woke herself up due to the pain, so confused and scared while shouting out, in a very tiny voice, for the Mum that never came. My Mum sat with her for up to 10 hours every day. She soothed her brow, she wet her lips with a swab when they began to look dry, she calmed her with soothing tones and she kept her company. A small act of kindness for a woman slowly dying. That’s what families do in that situation. They comfort their loved ones while slowly watching them die; because it’s the kindest thing to do. Those works are familiar ‘the kindest thing to do’, that’s exactly what I was told when that tiny bird was being ‘put out of its misery’. That tiny bird had more rights to death towards the end than my nan did. A common starling versus my nan. My nan, the WW2 survivor. My nan, the mother. My nan, the babysitter. My nan, the sister. My nan, the most resilient woman God breathed life into. And here she was. This remarkable woman. Being treated to the right to death by suffering in a morphine-induced state. She went for 8 days without food and water. 8 days! My Nan once told me, not so long ago, that she was ready. She’d had enough and she was tired. I wish I had the power to grant her this very small gift. I don’t know if things haven’t progressed to the state where we have the right to die in the UK because there are so many potential outcomes following a death from a legal perspective. In my eyes if you have the right brains writing the rules this shouldn’t even be an issue. Or if it is a very deep emotional feeling. The feeling that you may have made the wrong decision. There may have been a better ending than death had I decided differently. We need to take each individual case as it comes. I would have chosen for my Nan to have ‘gone’ warm in her bed, listening to Dean Martin, surrounded by her family, having just had some marmalade on toast (her breakfast staple for over 30 years). I could have lived with my decision knowing the only other options were death on a cold surgery table, or slow painful prolonged death while hooked up to a morphine drip. I’ve had to write this. I needed to get this out of my system. I’ve been angry, sad, worried, guilt-ridden and finally relieved. 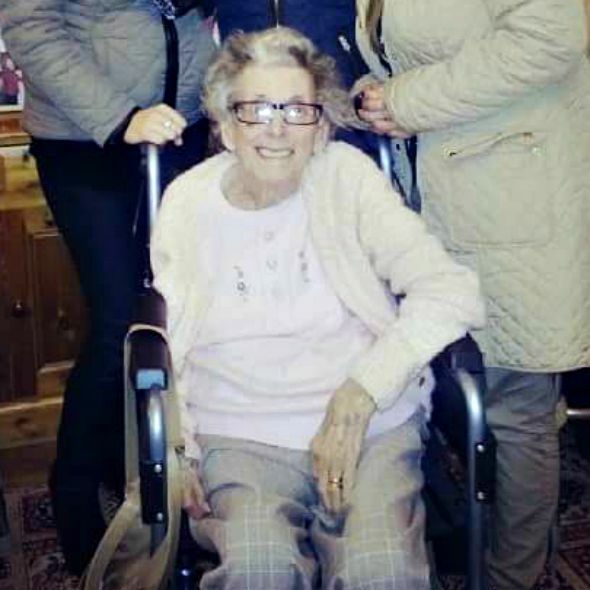 I will never rid myself of the final time I spent with my Nan. The day before she passed I sat with her and held her cold hand in a desperate attempt to warm her up. I read her the Metro (which I think eventually pushed her over the edge) and chatted to her about trivial things like the weather and what I’d done that weekend. I wanted to give her a sense of normality just in case she could hear me in her comatosed state. I told her it was ok to be with Granddad again and that I bet her sister couldn’t wait to see her. That we were all ok and would always love her. I also signed the right to death petition hours later. I urge you to please, please do the same: Sign the petition - Dignity in dying. A very sad and moving story. There is very little dignity in old age and death, the very best you can hope for is to die quietly at home in your sleep, but that’s not how it works out for too many of us. Once you do away with the sanctity of life, then there’s no going back. It will start with the very best of intentions, as highlighted by the heartbreaking story of Tashs’s gran, but once it’s on the statute book it will change and evolve. It is far too open to abuse, getting rid of the old and inconvenient on the grounds that it would ease their suffering, and it would be best to just ‘let them go.. Then what about the expense of looking after the very old and the very ill? That money could be much better spent on those who would have some quality of life, rather than just prolonging the suffering. No. I don’t agree. It’s an enormous step, disguised as a tiny little compassionate change, and I hope the bill doesn’t make into law. The thin end of the wedge? I think so. Thanks for taking the time to reply to my guest mail. I completely understand and respect your opinion. The lovely thing about having an outlet like a blog is to show a different side to the coin. I think we both perfectly demonstrated that here. While I’m sure you are a busy man may I request that you follow the link onto the ‘dying with dignity website’. You echoed my own fears about loopholes and removing the ‘inconvenient’ which is why if this bill passes, it has to be watertight. This will take time. But if you take Oregon as an example who has had the bill passed for roughly 18 years you will see that only 80 people out of 33k chose the right to die, and in that time it has not been abused. I believe these figures are from 2013. Again it is a sore subject for some and I’m not expecting to change the opinions if masses, I would just like to make people think. Thank you again for your reply and once again I wholeheartedly respect your stance on this. very interesting read, having been in a similar position of witnessing someone that I cared about go through a protracted end, I would endorse the right for people to be able to choose and make their own decisions. It is a very difficult subject that always throws up many problems and ultimately gets sidelined. Very touching. I’m pleased your friend allowed you to share. People should choose – until you’ve seen someone you love in a protracted death situation you can’t judge it yourself. What a heartbreaking experience for Tasha to have gone through with her poor grandmother. I have always been in favour of dignity in dying. I do not think it is right, or fair, that we are allowed to euthanise animals in the midst of their suffering to save them more pain, but cannot help a family member end their life when it gets unbearable for them. I can only hope by the time I am at the age where this is a possibility for me or my husband, laws have been changed, allowing us to go in comfort, not the idea of “comfort” that Tasha’s Nan had to suffer through. I’ve never thought about it before. Interesting blog post. I’d signed it, and emailed my MP about it too. I have MS. I’m aware that there may come a time when I’ve just had enough. Thank you for the moving post. I have thought about this but its very difficult to really know what I’d do as I’ve never been in this situation but I think if someone is really suffering and has no chance of returning to a decent quality of life then I’d be inclined to help them if dying was their wish.